HO-1 expression is elevated in the organs of sickle mice. 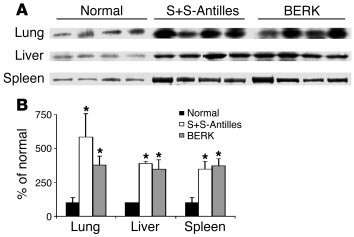 Western blots for HO-1 were performed on organ homogenates (1 μg of organ DNA per lane) from lungs, livers, and spleens of untreated normal, S+S-Antilles, and BERK mice. (A) The 32-kDa HO-1 bands are shown for each organ and each mouse. (B) The mean HO-1 band intensities (n = 4) ± SD are expressed as a percentage of those in normal control mice. *P < 0.05, normal versus sickle.